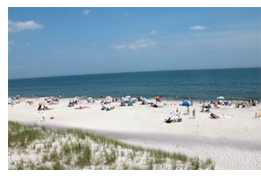 There are three public beaches in Watch Hill all overseen by the Fire District ParksCommission. 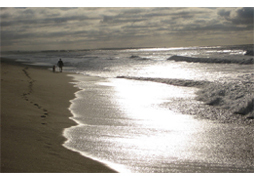 They include East Beach, the Watch Hill Public Beach, and the Napatree Point Conservation Area. Watch Hill Public Beach is open to the public for a fee and is free to Fire District Residents. There are also bathing facilities and lavatories available. Cabanas can be rented seasonally or daily for a fee. East Beach is accessible through a number of entrances located on Bluff Avenue, Everett Avenue, Niantic Avenue, and Manatuck Avenue. Please note that while the beach is open to the public, there are no lifeguards on duty, nor is there parking available in close proximity to these entrances. Parking on the side of the road is prohibited at all times and monitored closely by the Westerly Police Department. During the early summer months, areas are marked off for preservation of the Piping Plover, an endangered species of local dune-dwelling bird. Please give these areas a wide birth, and keep dogs on leashes. Napatree Point Conservation Area and beach is accessible via an entrance from Fort Road immediately adjacent to The Misquamicut Club parking lot. Foot paths are marked, and visitors are instructed to remain on the paths at all times. This sensitive area is also home to the Piping Plover and as with East Beach, will have several areas marked off during the early summer months. For those wishing to visit any of Watch Hill’s beaches, pay parking is available for the day. Please visit our “parking” section for more information. For those coming by boat, there is a public dinghy dock available.